After 300 years on the sea bed, the condition of objects is highly variable. When objects are in very good condition it’s easy to tell what they are made of, but when things have rusted, rotted, and decayed away that gets a lot harder. With extremely damaged objects conservators run into one fundamental problem: how do you fix something if you don’t know what it’s made of? Identifying materials is very important to conservation; if you don’t know what an object is made of you don’t know what techniques to use to clean and stabilize that artifact. Nobody wants to use the wrong acid to clean something, and then have to explain why the thing that was an artifact yesterday looks an awful lot like orange sludge today. Often, we can judge what material an artifact is made of using x-radiography to show density. If that fails, sometimes we can see or feel what things are made of. Is it magnetic and covered in orange corrosion? It’s probably iron. Brown, squidgy, and full of worm casings? Most likely wood. But what happens when we just don’t know? We don’t want to guess – guess wrong and the artifact dies – but we also can’t wait too long to find out or the artifact may corrode beyond repair. 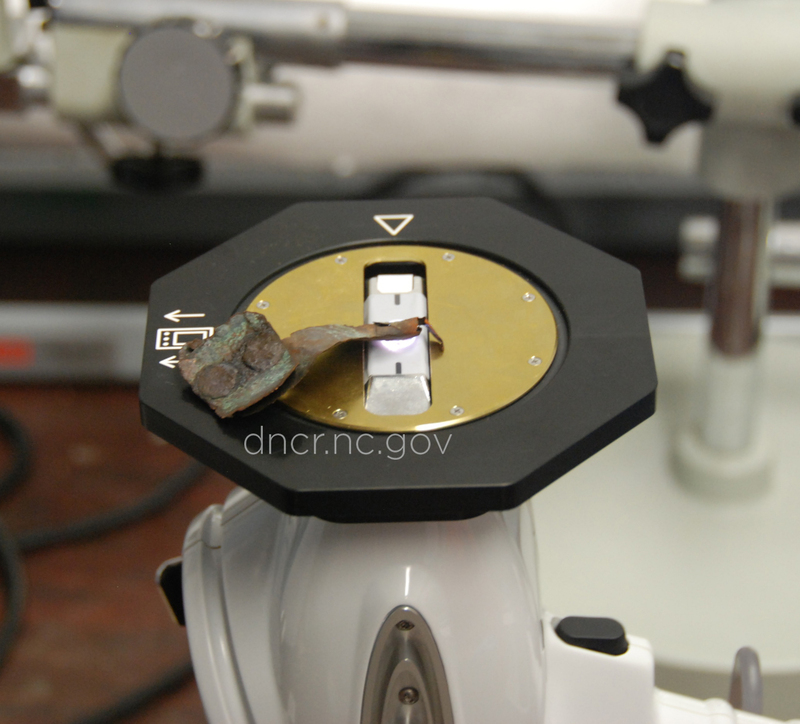 One of the methods conservators use at QAR Lab is X-Ray Fluorescence, or XRF. We use XRF to identify unknown materials, to compare the materials similar objects are made of, and to determine differences within objects. Most often we use this technique to identify metals which have simply corroded beyond recognition, and to analyze how objects like glass and ceramics were made. XRF is a spectroscopy technique, a method using the properties of light to determine what something is made of. In an XRF analyzer, a beam of light in the form of x-rays is fired out the front. This interacts with the material being analyzed, causing it to lose subatomic particles called electrons from one layer of the atom, which are replaced by electrons from another layer. This process releases energy, and the amount of energy is different for different elements. 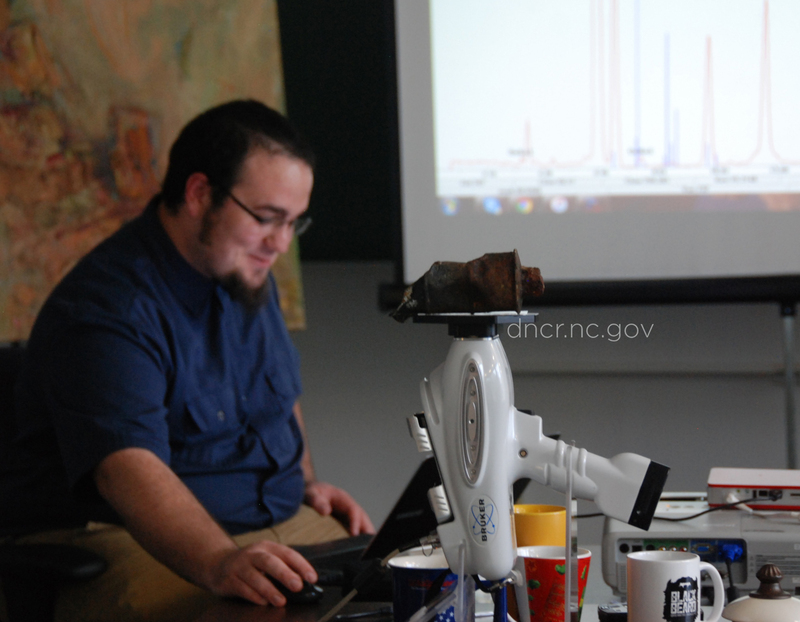 The XRF machine measures this energy and calculates what different types of atoms – what materials – are present in the object being analyzed. Because this method only uses x-rays it doesn’t damage the artifact in any way, so we can use it on fragile, unique, and important finds without worrying about destroying them. There are limits; the machine does not work on elements lighter than Aluminum, so organic materials like wood or leather are invisible to XRF. It is also less accurate on corroded, irregular surfaces, so it is not always possible to obtain exact percentages of what elements make up an object. However, much of the time XRF gives us enough information to tell broadly what an object is made of, and from there we can start that object back on the path towards a dry, stable life in a museum.